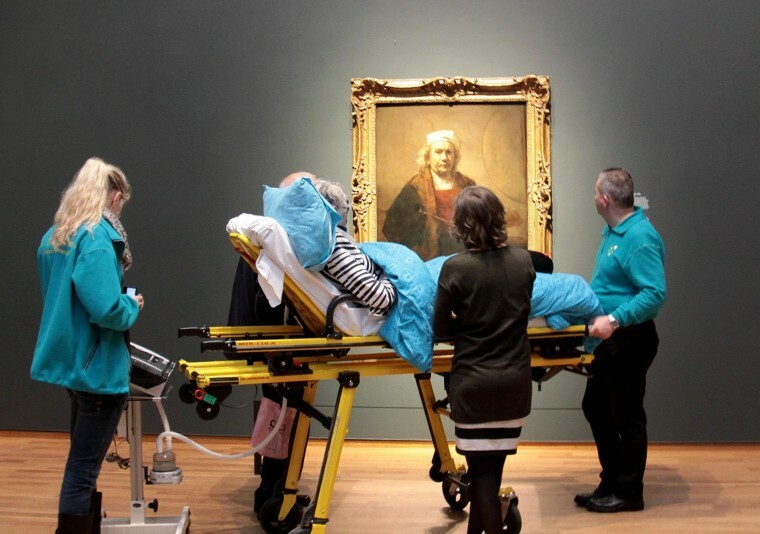 A charity helped fulfill the wish of a terminally ill woman to see Rembrandt's paintings, bringing her in a hospital bed to Amsterdam’s Rijksmuseum for the in-demand exhibit — just one of the 6,000 wishes granted since 2007. Stichting Ambulance Wens (Ambulance Wish Foundation) brought three terminally ill patients to the Dutch museum last week, including the 78-year-old woman who suffers from ALS — which is often referred to as Lou Gehrig's Disease. "The Ambulance Wish Foundation shows that people who are terminally ill and bed-ridden can have joy, even if they are sometimes so ill that they pass away on the same day or as in many cases a few days later," founder and director Kees Veldboer told NBC News in an email. "We stayed there for an hour on a beautiful sunny day, and tears of joy ran over his face due to this experience"
Veldboer, a former ambulance driver, said he got the idea for the foundation one day while on the job. He was helping move a patient from one hospital to another in November 2006, when he asked the man whether there was anything he wanted to see while he was outside. The man told Veldboer he had sailed for many years when he was healthy, so Veldboer stopped by the canal in Vlaardingen. "We stayed there for an hour on a beautiful sunny day, and tears of joy ran over his face due to this experience," he said. Veldboer promised the man he would help him sail one last time, even though the bed-ridden patient dismissed him, saying he didn't think he'd make it to Christmas. Working with a tour boat company and his boss, Veldboer was able to bring the patient on a stretcher aboard, for one last trip through the Rotterdam harbor. By April 2007, his foundation was born. Since then, the Ambulance Wish Foundation has accumulated six ambulances and 230 medically trained volunteers, who have helped fulfill nearly 6,000 wishes. Many are chronicled on the foundation's Facebook page, including the story of a woman who wanted to spend one last day on the beach with her dog and another patient who wished to visit a water park. "Our foundation adds a quality of life to (last) days," Veldboer said.